Fabulous and Brunette: Casket Girl by Maggie Mae Gallagher - Book Blast - Giveaway - Enter Daily! 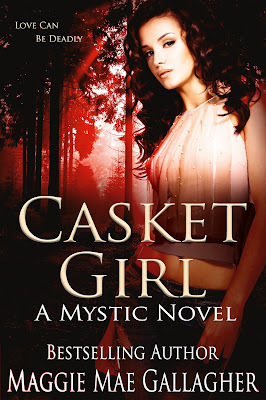 Casket Girl by Maggie Mae Gallagher - Book Blast - Giveaway - Enter Daily! Hi lovelies! It gives me great pleasure today to host Maggie Mae Gallagher and her new book, “Casket Girl”! For other stops on her Goddess Fish Promotions Book Tour, please click on the banner above or any of the images in this post. Be sure to make it to the end of this post to enter to win a $15 Amazon or Barnes and Noble Gift Card! Also, come back daily to interact with Maggie and to increase your chances of winning! “I need to inform you first of your right to have an attorney present.” There was the uptight termagant for rules, law and order. “Why would I need an attorney? You don’t think I’m a suspect, do you?” A stifled laugh caught and died in her throat. She, Isabelle Toussánt, a suspect in a murder case? Not in this lifetime. Although, by his tone she instinctively knew he wasn’t kidding, not one bit. Isabelle was rarely ever shocked. Her gift of foresight kind of gave her the 411 on what was coming, most of the time. This was a curve she hadn’t expected. What was next, the revival of the Spanish Inquisition? Like she’d already done at least a half-dozen times for the New Orleans police, but what was one more time hashing through the gory details of a morning she’d rather be forgetting? “I woke up early, just before dawn,” she explained, unease settling in her belly. He couldn’t really believe she was capable of something like that, could he? Her persona didn’t scream psycho killer in her book. Maybe she was a bit eclectic in her tastes, but she didn’t even kill spiders, preferring to relocate them outside. “Is that a habit of yours?” he asked, looking up from his note-taking. “I’m a pretty early riser, but lately I’ve been waking earlier than usual.” She couldn’t believe she’d just admitted that. She might as well have painted a sign on her forehead that read, Potential killer. Ask me how. She shook her head at the absurdity of it all. “Any particular reason?” His pen hovered above the notepad. How did she answer this one without sounding guilty? Because if she indicated that she’d been having bad dreams that were giving her bits of early morning insomnia, he’d want to know what they were about. She didn’t want to explain this point, not when the dreams were rooted in her past. Then she’d have to explain the beatings and abuse. The last emotion she wanted to see on his face was pity. She’d gotten out. She’d survived the trauma. And even if there were parts of her that still resonated with her past, there was nothing she could gain from telling him the truth. She’d beg forgiveness from the goddess later for her dishonesty. No good would come out of explaining this to him, there was no point. She knew she had nothing to do with Kiri’s murder. “No,” she lied, controlling her features, understanding that he could toss her in jail for obstruction on a federal case. And then they would discover the truth, the one she’d kept buried for years regarding her identity. If it got out… A terrified tremor ran along her spine. Then he would know and he would find her. She’d rather die. Maggie will be awarding a $15 Amazon or Barnes and Noble Gift Card to a randomly drawn winner via Rafflecopter during the tour. Hi Maggie ~ It is great to have you here! Congrats on your new book and good luck on the book tour!